CALGARY, Alta. 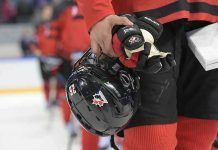 – Canada’s National Men’s Under-18 Team will begin to assemble in Etobicoke, Ont., next week before flying to Russia for two pre-tournament games leading up to the 2018 IIHF U18 World Championship, Apr. 19-29 in Chelyabinsk and Magnitogorsk, Russia.